Meet the two newest red heads of Vinylmation. First, Julie Young. 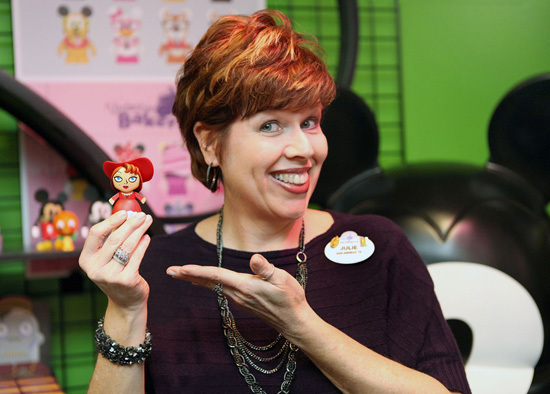 She has been a long time merchandiser with Disney Pins and according to the Disney Parks Blog is coming over to Vinylmation. She also was in one of Steven Miller’s interviews when he joined the team back 9 years ago. Congrats to Julie! Also, Julie seems to be holding what we can only assume is a Park Starz version of the Red Head from Pirates of the Caribbean. 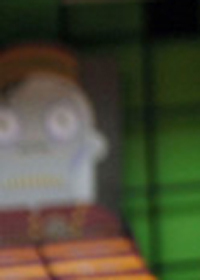 Could this be another Park Starz 2 figure? (She doesn’t say anything about the figure in her interview.) How do you think it compares to the famous animatronic? Thanks to Michael for taking a closer look. He spotted what looks like it maybe be a Park Starz Orange Bird in the background. What do you think? Well Steven Miller already answered this question, with a big fat YES! 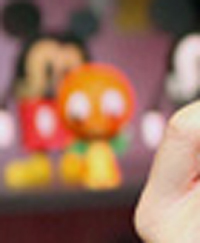 It also looks like an Orange Bird Park Starz figure in the background. Good eyes, Penguin! That does look like a Park Starz orange bird in the background. In the lower left hand corner, looks like the ToT bell hop from Mickey’s Circus on the Park Starz 2 packaging. I love Park Starz, and can’t wait for Park Starz 2 to be released! Belay there Penguin….. We’ll take the Redhead AND the Orange Bird. Love the RedHead!!! Park Starz 2 is shaping up nicely, I must say. It’s hard to tell if Orange Bird is a PS or a Popcorns. It looks much bigger than previously released PSs. 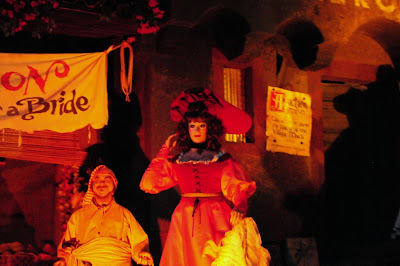 I hope Disney has plans for a Park Starz Haunted Mansion Cast Member. Cannot wait til May for PS2! Welp. I NEED that Orange Bird.